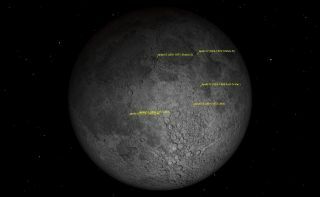 The six sites on the moon where Apollo astronauts landed make interesting targets for amateur telescopes. It has now been more than 40 years since humans last walked on the moon, but it's still interesting to seek out their landing spots with a telescope. You won't see anything left behind by the Apollo astronauts, but you can compare the views in your amateur telescope with the published photographs taken by them. Apollo 11 landed on July 20, 1969, on a vast flat area in the Mare Tranquillitatis, the so-called "Sea of Tranquility." Even so, mission commander Neil Armstrong saw that he and Buzz Aldrin were heading straight for a rubble pile, and took over manual control to set the lunar lander Eagle down in a more suitable spot. The Apollo 11 landing site is the hardest to spot with your telescope because it is in a mostly crater-free area. It is located just east of the twin craters Ritter and Sabine. The three tiny craters nearby, now named for the three Apollo 11 astronauts — Armstrong, Aldrin and command module pilot Michael Collins — are hard to see unless lighting conditions are exactly right. Apollo 12 landed on Nov. 19, 1969, on an equally flat area in the Mare Insularum (Sea of Isles), just southeast of the crater Lansberg. This landing was deliberately made close to where NASA's unmanned Surveyor 3 probe had touched down two years earlier. The astronauts were able to walk to Surveyor, photograph it and retrieve parts of it for return to Earth. The near-disastrous Apollo 13 was supposed to land at Fra Mauro, a crater close to the Apollo 12 site,.Apollo 13's emergency return to Earth in April 1970 put NASA's manned moon program on hold for nearly a year, and then Apollo 14 carried on with the Fra Mauro landing on Feb. 5, 1971. This was much rougher terrain, and the astronauts discovered how hard it was to navigate on the lunar surface. Apollo 15 landed on July 30, 1971, in a small valley surrounded by mountains in the lunar Apennine range. The sinuous Hadley Rille runs through this valley, and can be spotted with larger amateur telescopes. Apollo 15 was the first of three extended missions during which the astronauts spent three days on the lunar surface and used a moon buggy to cover more territory. Apollo 16 landed on April 21, 1972, in the highlands near the crater Descartes. This was the first landing in mountainous terrain, and allowed the astronauts to gather surface material from a much earlier time period in the moon's history than was possible in the first four landings on the lunar maria. The actual landing site is just north of Descartes. Apollo 17 landed on Dec. 11, 1972, just south of the crater Littrow, near the Taurus Mountains. The sun is now too high in this area to observe it well. Your next opportunities will be on April 27 (waning gibbous moon, setting sun) and May 14 (waxing crescent moon, rising sun). This was the only Apollo mission to have a scientist aboard, geologist Harrison Schmitt. The Apollo 17 crew lifted off the lunar surface on Dec. 14, 1972, and humanity hasn't visited another world since. Although you won’t see the footsteps of the astronauts or the flags left behind, it is still worthwhile to have a look with your telescope at the places where humans have ventured farthest.